Over the last month or so Ebi-kun has had an annoying cough, it isn't a deep chesty cough, he sounds like he is continuously cleaning his throat. So we have been going to the doctor and trying out various medications to figure out what it is. Last week I had to take him everyday to go on the nebuliser and the end of the week he ended up having a steroid IV. The poor kid has been going to school but hasn't been sleeping well so he was exhausted, the IV does appear to be working, they also took blood to run tests to see if anything showed up. We went back yesterday, my husband was back from Germany so we all went. family outing to the doctors, who-hoo. The blood tests didn't show anything odd so the doc decided to give him another IV and some more syrup and tablets. 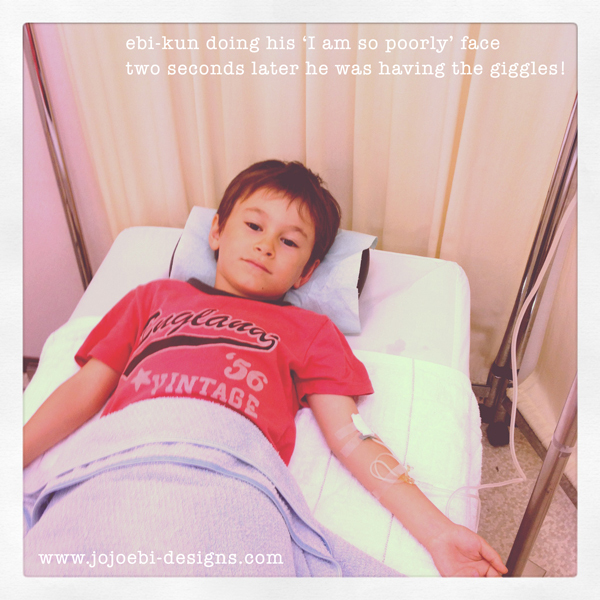 Now, don't be alarmed at this photo, this is Ebi-kun doing his 'I am really poorly' face, I should get him on the TV, little actor! I have to say, he is the perfect patient. Didn't even flinch when the nurse took blood and put the IV in, watched everything she was doing and even asked her questions. It reminded me of when he broke his arm, as soon as we went in to get an x-ray, he stopped crying and started asking the technician loads of questions about the x-ray machine. The poor technician was completely bemused! So, now we wait and see. He has been sleeping better the last couple of nights, maybe the cooler weather has helped too. One funny thing that did happen at the clinic, the doc speaks a bit of English, I always make sure I speak slowly and try to use Japanese if I can. Yesterday, my husband was with us and the doc suddenly came out with perfect English, proper long sentences, not basic sentences and odd words like he had been using all week, couldn't believe it! I still don't understand why he wasn't talking to us in Japanese, very amusing. My boy had the same for a few weeks back in April when he started the shougako. they thought that it could be asthma but finally he was fine. I hope Ebi-kun gets well soon.